eats and beats: Don't Have All the Money In the World To Throw Dinner Parties? Don't Have All the Money In the World To Throw Dinner Parties? After sharing this quotation on my Facebook page yesterday and encouraging everyone who feels intimidated by hosting to muster up the courage to do it anyway, one of my readers expressed a concern about hosting that had nothing to do with confidence and everything to do with finances. It's one thing to be able to silence a negative voice in your head, but when the bottom line of your bank account speaks to you, you have to listen. Lest you all think I'm a socialite who eats brie every evening and stuffs my pillow case with $20 bills, I'm not. We're a single-income family, and, though my husband makes a fair salary, we live in a townhouse outside outside of DC where life is very expensive. Our washing machine, which only works properly on the "whites" cycle, now looks like it may stop working altogether, and unless there's a company out there who wants to send me a new one in exchange for a feature on my blog, we'll be looking on Craigslist for a replacement. But it's even better that way. Know why? Because if your life is always glamorous and you can have anything you want whenever you want it, dinner parties are not going to stand out in a special way from your normal life. It's the special time with special friends under special circumstances that makes dinner parties so memorable. A Few Special Ingredients- I used to plan my dinner party menus with little thought to the cost of the ingredients, until I realized that all that specialty cheese, prosciutto, high-end chocolate, and fresh herbs resulted in a meal that was $250+. Start with some inexpensive ingredients and then decide how to elevate them with a few, well-chosen, SEASONAL ingredients with a lot of flavor. I tend to go with great cheese, fresh herbs, and nice fruit. Chicken and Potatoes is A-Okay- Don't let anyone tell you that you need to serve salmon or expensive roasts, that something like chicken would be an embarrassment at a nice dinner party. 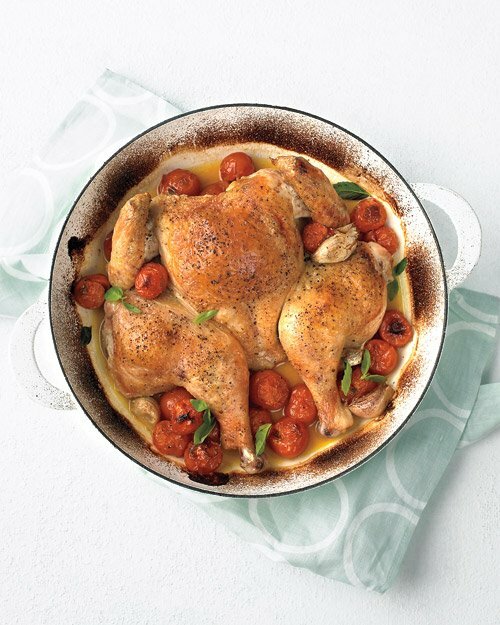 Look at this Spatchcocked Chicken by Martha Stewart. 5 of the 9 ingredients you're likely to have on hand already! And the only really fancy ingredient is white wine which can be purchased in very small, inexpensive bottles or can be substituted for white grape juice if you don't like to cook with alcohol. Make this in August when tomatoes are at their very best and you're golden. Heck, I might make this for dinner for just my husband and myself sometime! In fact, Martha has a whole list of roasted chicken recipes I'm going to be digging into! Make Your Ingredients Do Double or Triple Duty in One Meal- I find that there are some ingredients that I always have to buy more of than I really need. All that extra can be expensive and wasteful if I'm not careful. Heavy cream is one of them. But I have learned how to make a menu that will call for that ingredient more than once. For my Fancy Dinner Party Menu, I used it in both the Chicken Fricassee and the Fall Veggie Bisque. I could have easily chosen a dessert that called for heavy cream as well. Make Enough for Leftovers- Another way to make the most of leftover ingredients is to simply make more food than is needed for the party. If your ingredients could allow you to make an extra 50% if you were to just get a little extra chicken, get the chicken. That way your money has gone toward two or three meals instead of just one! Serve Pizza- Nope; I'm not kidding. Learn how to make your own pizza dough (not hard!,) find a great sauce (Wegman's makes very good sauce,) choose some fun toppings and serve it with salad and garlic bread. One of my readers had a dinner party this way while her house was in the midst of being redecorated. They even ate picnic-style on the floor! She ended the night with a homemade chocolate cake. Sounds absolutely perfect to me! Serve Soup, Salad, and Bread- Dress up your table, present the food in pretty serving dishes if you have them, light some candles, and you have yourself a cozy and charming meal. Childcare- I like to host sans kids, but I don't want to pay for a babysitter if I can help it. I've actually never paid for childcare. Partly because I rarely leave my kids with anyone besides their grandparents, and partly because I have an awesome group of friends and we usually just take turns watching each others kids. Have an Herb Garden- Fresh herbs trump dry ones period. I do use dry ones, too, but I cook with fresh ones all the time. The flavor difference is remarkable. But fresh herbs are expensive, so I recommend budgeting for a modest herb garden (preferably in a planter so that you can take it indoors during the cold season.) Seeds are very reasonably priced and you can reap the benefits of your herbs all year. Make Own Bread- I should tell you that I do not have the best instincts for bread-making, but I'm learning because good bread is such an inexpensive way to add a special touch to your dinner party, as part of an appetizer, with the soup/salad course, or alongside the main course. Know Where to Shop- Home Goods, Target, and World Market are my three favorite places to find inexpensive dining & entertaining pieces on a budget. Craigslist is where it's at for inexpensive dining tables and chairs. Be patient and you'll find a steal. Our table was hideous but had beautiful lines. I painted it black and now hope it's the only table we'll ever have to own. $200. Our 8 chairs are real wood and they cost a total of $35. Hosting/Hobby Budget- This one may seem like a cop-out, but it really is one of the ways we save money. Hosting is my main hobby, so it's usually where my personal spending money goes. So, if our grocery budget won't cover the cost, I tap into my "fun funds." Serve Fancy Water- Even though I offer a variety of beverage options in my menus for the blog, I almost always serve a bumped up version of water (unless it's a breakfast or brunch that I'm hosting.) I don't drink alcohol, so wine is out, and I find that don't like my beverages competing heavily with the flavor of the food. So I choose water, put it in a punch bowl or nice pitcher and spruce it up with something like frozen raspberries, sliced citrus fruit, cucumber, or mint. Have a Set of Neutral-Colored Cloth Napkins- My dishes and serving pieces are all white, wooden, metal or glass, so any color I want to add to the table (besides through food) needs to come from the table linens. But who has the money to buy 5 full sets of table linens! Not I! So, I keep a set of ecru-colored cloth napkins that I can then supplement with whichever more colorful cloth napkins I choose for that event. That way I can have more variety for the money. Glad you made it my way!